The Foundry Gallery was once the site of an important Ironworks making ironwork for all the seaside towns on the south coast, including Brighton, and sent its products all over the world. Now it has been transformed by Artemis Arts into a gallery showing exhibitions and staging concerts, workshops and other exciting events. Part of Artwave 2010 in Lewes, the exhibition ‘Outside’ is an opportunity for four artists who have a physical relationship with their surroundings to show their differing approaches to Landscape. They call it ‘the most important subject in art’ and like to experience the ‘outside’ environment even if paintings are developed later on the ‘inside’. talks of making something intrinsically fleeting into a lasting record and seeks those moments when weather and light produce inspiring flashes and illuminates previously unseen aspects. creates canvases which show vigorous and dramatic countryside sometimes cut with panels of differently lit areas showing moody and subtle shifts of light. paintings are graphic scenes of mystery and imagination. He began work in design and advertising and looks for moments of stillness and isolation. He ranges from large paintings to small pen and ink drawings which depict an ‘enhanced memory of the place’. grew up in the Black Country and this early experience has influenced his work. There is a mysterious quality to his paintings which feature events and places of the past whilst referencing the place. 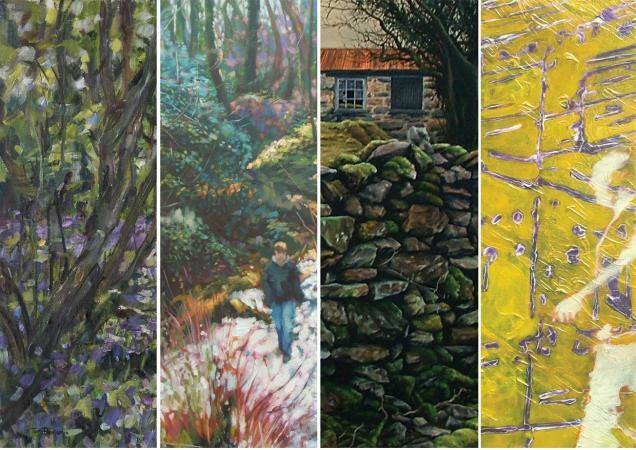 What binds these four painters is the focus on landscape as the starting point linked to atmosphere and memories. The Foundry Gallery is an ideal location to show their work. The stark simplicity of the industrial setting and the interplay of the changing light throughout the day, offers a unique environment to appreciate the scale and diversity of their paintings. A series of workshops and talks given by the artists in the gallery during this exhibition (for details click here) are on offer which can be booked through the website or by phone. There will be free artist led family workshops and tutored practical sessions during weekdays, suitable for beginners and experienced artists.